If you feel like you pay WAY TOO MUCH IN TAXES, you are not alone! In fact, the Government Accountability Office (GAO) thinks you pay too much too! They estimate that taxpayers overpay their taxes by about $945 million each year due to mistakes they and their tax preparers make on their tax returns! Imagine what could happen if you could plan how much you pay in taxes and when you pay. We will help you legally earn more money, keep more of what you earn, and PAY LESS TAX! 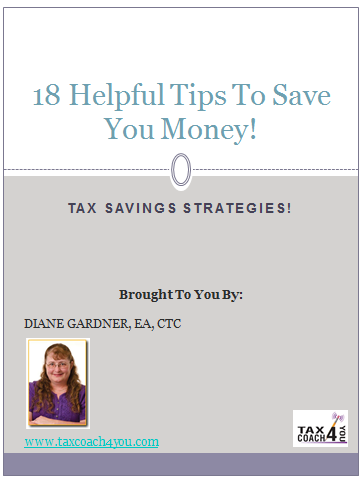 Planning is the key to successfully and legally reducing your tax liability. We go beyond tax compliance and proactively recommend tax saving strategies to maximize your after-tax income. We are committed to making sure you don’t overpay your taxes! A tax coach is similar to other types of coaches. Your tax strategist/coach will come along side you, look at your business and financial information, and then determine where you may be wasting money by over paying your taxes. Taxes are your biggest expense and it makes sense to focus your financial defense where you spend the most. And most tax advisers aren’t very proactive when it comes to saving their clients’ money. They put the “right” numbers in the “right” boxes on the “right forms,” and get them filed by the “right” deadlines. But then they call it a day. They do a fine job recording the history you give them. But wouldn’t you prefer someone to help you write history?